In 1877, the medical faculty of the University of Pennsylvania proposed that a department of dental medicine be established. The Medical Committee of the Board of Trustees of the University authorized a committee of the medical faculty to approach the two existing dental schools in Philadelphia–the Pennsylvania College of Dental Surgery established in 1856 and the Philadelphia Dental College founded in 1863–to inquire whether one or the other would agree to become associated with the University. The faculties of both schools officially declined the proposal, but Dean Charles J. Essig, and Drs. Edwin T. Darby, George T. Barker and James Tyson of the Pennsylvania College of Dental Surgery indicated their approval and interest. These men were invited to join the faculty of the University and thereby formed the nucleus of the new dental department of the University. The Department of Dentistry of the University of Pennsylvania opened in April 1878 with Dr. Essig as Secretary of the faculty (a position equivalent to the deanship). 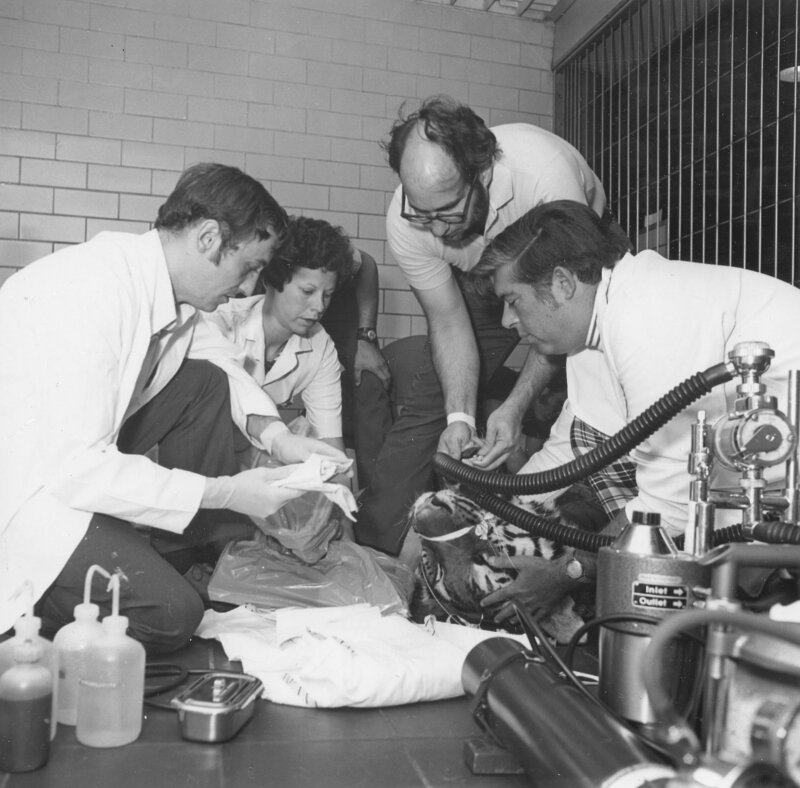 After Harvard and Michigan, Penn became the third university in the country to establish a school of dental medicine. The first class had a total of fifty-two students, half of whom transferred from the Pennsylvania College of Dental Surgery. The University required students to complete a two-year curriculum including operative and mechanical dentistry, dental histology, dental pathology, metallurgy, chemistry, anatomy, physiology, materia medica and therapeutics; a thesis; and a presentation of treatments of patients in operative and prosthetic dentistry. In 1879 twenty-five of the original fifty-two students were awarded the degree of Doctor of Dental Surgery. When Dr. Truman became dean of the school in 1883, he began to introduce preclinical technical work into the courses in prosthetic dentistry. The introduction of these courses, as well as the requirements of the National Association of Dental Faculties, resulted in an extension of the dental program to three years in 1891. With this emerged the need for better facilities. The school proposed the construction of a new school before Truman’s retirement in 1895. The school was first located in the basement of Medical Hall (later Logan Hall and now Claudia Cohen Hall). In 1878, it moved to the first floor of the new Hare Laboratories, at the corner of 36th and Spruce Streets (now the site of Williams Hall), and remained there for over sixteen years. The Dental Hall, located on Smith Walk between 33rd and 34th Streets (currently known as Hayden Hall), served as the site of the school from 1895 to 1914. Under the deanship of Edward C. Kirk, who served from 1895 to 1917, the Dental School enhanced its international reputation. The school proposed to increase the study of dentistry from three years to four years in 1903. Lacking support from other schools, however, the idea did not come to fruition until 1917. Under Kirk’s administration, the school established its graduate program in 1910 to keep abreast of the latest developments in dental medicine and techniques. 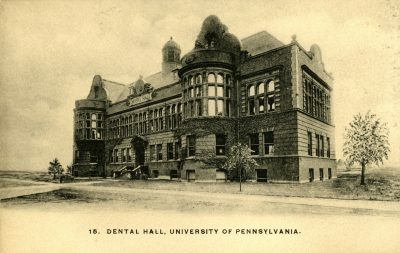 In 1909, the Pennsylvania College of Dental Surgery, short of funds to modernize its equipment and enlarge its teaching staff, merged with the Dental School of the University. In 1916, the school further expanded by merging with the Dental Department of the Medico-Chirurgical College of Philadelphia. As a result of these mergers as well as the admission of women, which began in 1914, the student body increased, calling for yet another new building. The formal affiliation of the Dental School with the Thomas W. Evans Museum and Institute Society was another landmark event in the school’s history. Thomas W. Evans, a dentist from Philadelphia who gained both his fame and fortune through personal dental services for the French emperor Louis Napoleon and other European royal families, bequeathed a great portion of his wealth for the establishment of a dental school in Philadelphia not inferior to any already established in the city. For this purpose, the above mentioned Society was formed. 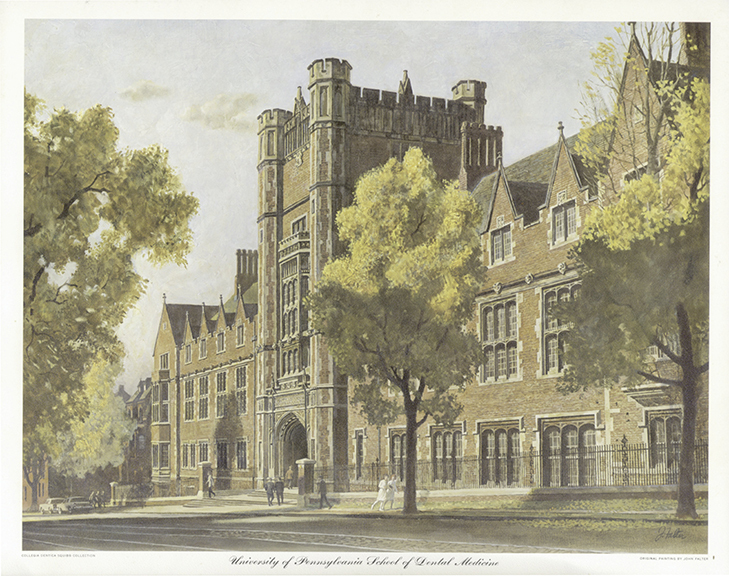 The Trustees of the Society, however, soon concluded that it was more worthwhile to affiliate with the University of Pennsylvania instead of creating a separate dental school. An agreement was reached whereby the University would assume the responsibility of instruction and the Evans Institute Society would erect a new dental building. The new institution was to be called the Thomas W. Evans Museum and Dental Institute School of Dentistry University of Pennsylvania. Located on the site of the former Evans estate at the corner of the 40th and Spruce Street and completed in early 1915, the new building housed both the Dental School with its new lecture halls, clinics, and laboratories, and the Evans Museum. Dr. Charles R. Turner succeeded Kirk as dean in 1917, the same year that the four-year course in dentistry became effective. In 1921, the requirements for admission were raised to one year of college; this was further extended to two years of college in 1927. In response to student demand for a Bachelor’s degree program, the University and the Dental School announced in 1919 a seven-year course leading to both the A.B. and D.D.S. degrees. The school introduced a course in internal medicine for dental students in 1934. This program encouraged the students to consider the patient as a whole, something often neglected in the development of techniques in dentistry. The course under the direction of internists at the University Hospital was among the first of its kind offered in the United States. In 1921, Turner also approved the establishment of the School of Dental Hygiene, whose chief administrative officer and faculty were to be staffed by members of the faculty of the Dental School. After completing a one-year training course, the student was awarded a certificate of proficiency. William A. Jaquette served as the director and Professor of Oral Hygiene, and Miss Charlotte J. Klatt as supervisor and instructor in Clinical Prophylaxis. Klatt remained with the University for over forty years. Under her leadership, the program became one of the most outstanding in the country. J.L.T. Appleton, dean from 1941 to 1951, emphasized the role of dentistry in the health professions and strengthened association with the Graduate School of Medicine and the Graduate School of Arts and Sciences. The demand for graduate education in areas of dental medicine, such as endodontia and periodontia, resulted in the creation of a Department of Dentistry in the Graduate School of Medicine. To prepare students for teaching and research in dental schools and institutions, several departments of the Dental School established interdisciplinary programs with the Graduate School of Arts and Sciences. For the training of more auxiliary dental personnel, the school developed a course for dental assistants in this period. Lester W. Burket, dean from 1951 to 1972, further promoted oral medicine as a concept in dentistry. In 1964, the school changed its name from the School of Dentistry to the School of Dental Medicine. The school reoriented and expanded its educational and research programs and rehabilitated its facilities. Clinics were re-equipped or modified to permit better teaching and the use of new techniques and clinical procedures. The curriculum also became more dynamic and flexible. The school established a Learning Laboratory which made extensive use of color video TV cassettes and slide-tape facilities and permitted individual patterns for student learning. With a much increased demand on dental research, two new buildings were erected in this period–the Dental Research Building in 1958 and the Levy Oral Health Sciences Building in 1969. When the Dental School celebrated its centennial anniversary in 1978, it was the third largest in the United States with over 700 dental, hygiene and postgraduate students and a faculty of about 100 full-time and 300 part-time teachers. The school enjoyed affiliation with the Medical College of Pennsylvania, the Albert Einstein Medical Center, Moss Rehabilitation Center, and the Hebrew University of Jerusalem. The school, in the words of Dr. Walter Cohen, dean from 1972 to 1983, looked forward to “assuming an international position of preeminence in dental education” in its second century.